The name Rickman carries a pedigree like few others in the motorcycle industry, when it is followed by Metisse you are dealing with royalty, the king of custom frames built by two genius brothers with racing in their DNA. But what you have before you is no off road scrambler, but a 100% street legal urban tracker that can be easily returned to its roots in no time at all. 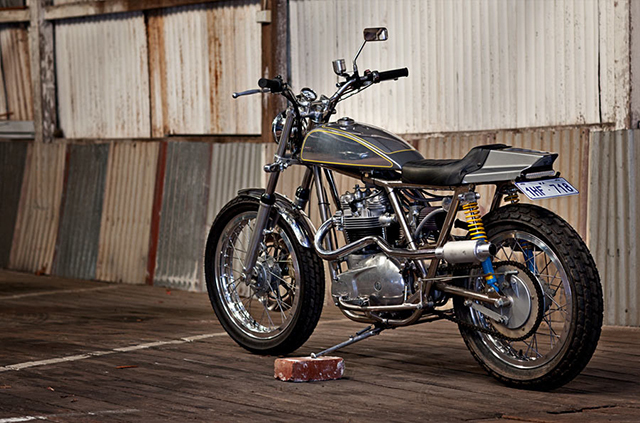 An original classic or a ball tearing street weapon, it’s a 1974 Rickman Metisse with Triumph power built by Australia’s 66 Motorcycles and is simply known as “The Brit”. For those not familiar with the Rickman brand it was a creation of two very successful Scrambles racers of the Golden Era, Don & Derek Rickman. Despite great on track success throughout the late 50’s and into the 60’s they became less and less impressed by the machines the big factories were turning out. So rather than complain they put their engineering minds together and started building frames and components that could accept an array of factory engines. Instantly they were on track winners and every man and his dog wanted one, so they entered into limited production runs and the rest they say is history. The bike before you sports one of Rickman’s Metisse frames built in 1974 to accept a 750cc Triumph engine, a popular combination at the time. Normally a Rickman Matisse would stay untouched, but the owner wanted his Metisse street legal, designed for on road rather than dirt bike riding and it had to be able to be converted back to original specs. 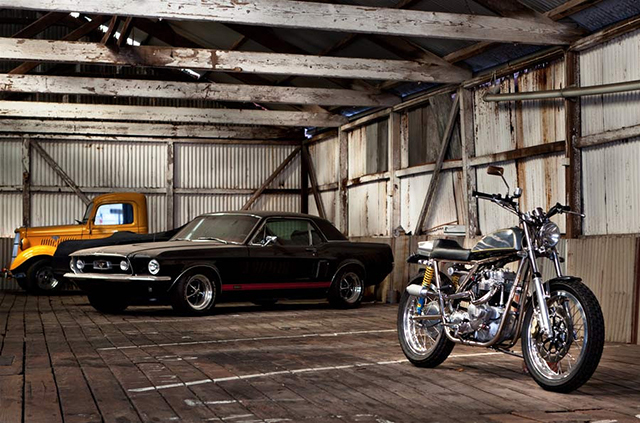 That’s no easy task but 66 Motorcycles are masters of turning wrecks to riches, now starting with quality they built a masterpiece. The bike was stripped down to its bare frame and some serious elbow grease was put in to restore the shine of the nickel plated frame. The recently rebuilt engine to competition specs was in fantastic condition internally but needed work to bring its aesthetics up to Metisse style standards. 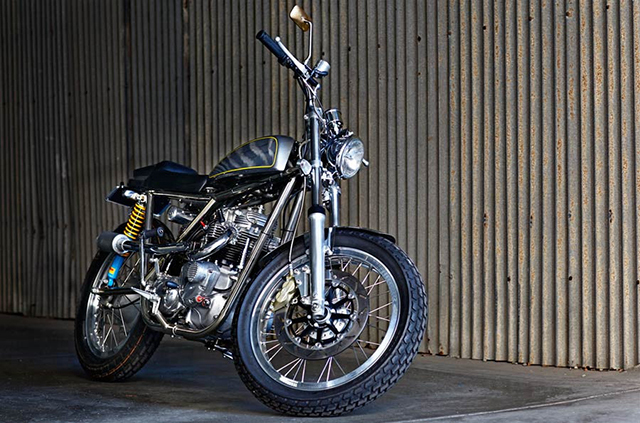 To give the front end more road appropriate performance a set of Yamaha XS650 forks have been rebuilt to the desired specs. A set of custom triple trees have been modified to accept the XS stem while modern tapered bearings provide precise steering. To pull this urban warrior to a rapid halt is an industry leading 4 pot Brembo caliper mated to a 320mm disc with power provided by a Nissin master cylinder. The Metisse frame by the Rickman brothers is a thing of beauty, over engineered, welds to die for and nickel plating mean the body work needs to be first class to match. 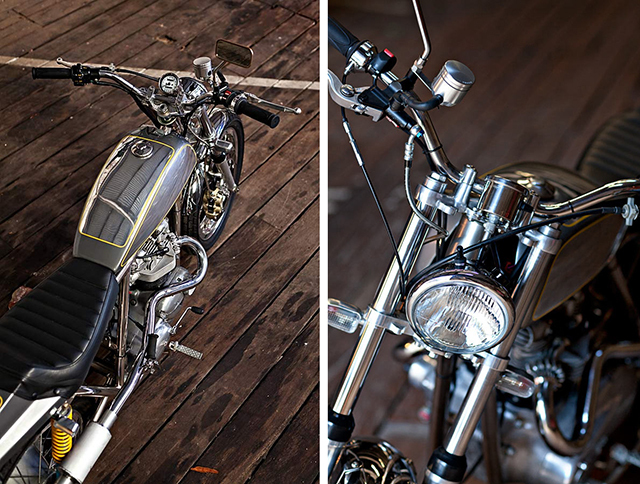 66 Motorcycles picked up a highly polished aluminium tank from Japan and then set about modifying it to fit the frame and give the look they were after. The tracker rear is also aluminium but was designed to fit a Triumph Thruxton, but with considerable work including narrowing and shortening, it now fits the frame like it was meant to be. The seat is upholstered in period leather with just enough padding to soak up the odd bump. Making the Metisse street legal required the fitting of indicators, horn, headlight and tail light, a set of idiot lights and a mirror to see the traffic disappearing behind you. And while the Metisse frame is magnificent, 1970’s electrics are not, so a new wiring harness was made to run all the road going requirements and an Anti Gravity 4 cell Lithium battery has been located under the seat to provide a strong 12v. 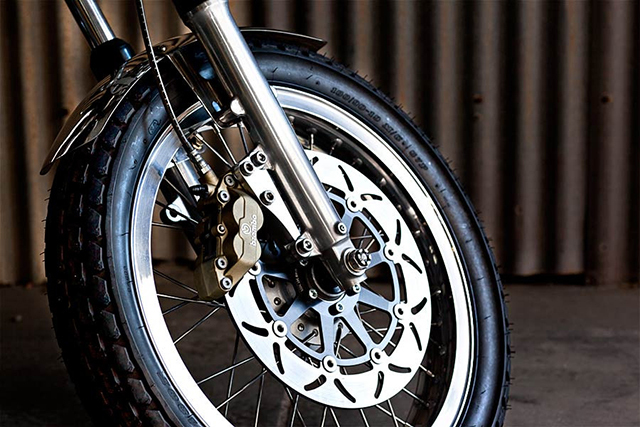 The front rim is a Morad item laced to an XS hub while the Dunlop K180 tyres provide both the look and the grip that are befitting of this modern Metisse. 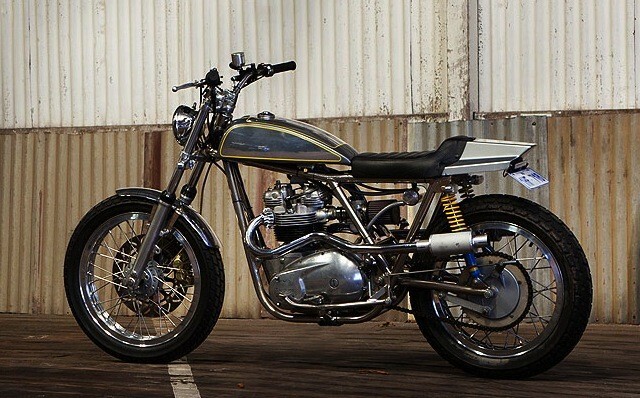 The finished machine by 66 Motorcycles is simply a thing of beauty and one the Rickman brothers would no doubt give their approval. 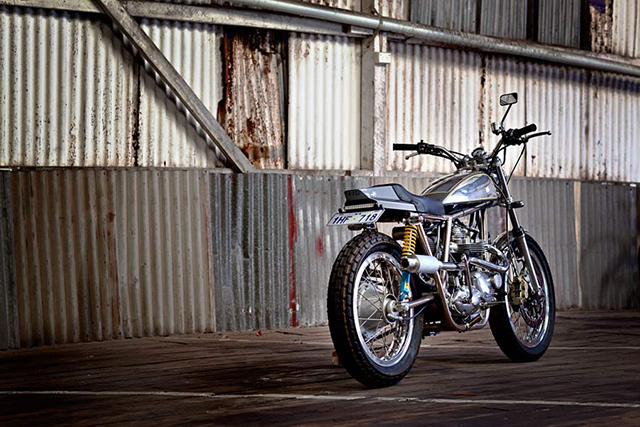 Now its owner has the keys to an urban assault warrior that can easily be converted back to the original scrambler classic just the way it was born, as Don used to say, job done!